Elections matter more than opinion polls, both as a real test of opinion and as a mechanism to change various levels of government – but the emergence of a consistent Labour lead in recent polls is highly significant. It undoubtedly reflects in significant part the damage done to the Tory Party by Brexit, and the fighting within the Conservative Party it has produced, and the correct handling of the issue by Jeremy Corbyn’s leadership of Labour. In the last 8 opinion polls recorded by Britain Elects, Labour has a significant lead in 5 of them, while the Tories are ahead by 1 point in two of the polls and another is tied. The average poll lead for Labour over the polls from 29 March onwards is 3½ points. Within that, Labour is ahead in all the 4 most recent polls, with an average lead of just under 6 points. This contrasts with often large leads for the Tories through the whole of February through to mid-March. Clearly, in the febrile atmosphere around the Brexit crisis polls show political allegiances are more volatile than normal. But the pattern is clearer from mid-2017 onwards, when Labour was well ahead of the Tories in the polls in the immediate aftermath of the general election. At its height, Labour was 8 points ahead in one YouGov poll in early July 2017, on 46 points. The Tories were then on 38 points. Since that time both of the major parties have lost ground. The low-point for their combined vote was in another YouGov poll at just 60 per cent earlier in April. This is a combined decline of 24 per cent for the two major parties in under 2 years. In effect, in that period the Tories lost ground to UKIP while Labour lost ground to the LibDems, SNP and Greens (and, where it is polled the Change UK party). Politically this represents a transfer of pro-Brexit votes away from the Tories and a transfer of pro-Remain votes away from Labour. However in the most recent period those trends have altered. The Tory polling has lurched sharply lower (the 2 most recent polls show it below 30 per cent), while Labour has begun to win votes and is above its recent post-election low seen earlier this year at 31 per cent. In the period since the general election UKIP has been transformed from a right-wing, xenophobic electoral grouping to one which now openly associates with fascist street fighters on the far right. Farage has also launched a Brexit party which will occupy the space of his old UKIP outfit. It seems likely the Tories will lose votes to both of these in the upcoming elections to the European parliament. It remains the case that a Corbyn-led Labour government is bitterly opposed by the ruling class. There is therefore a concerted effort to prevent those Remain votes, or any others, returning to Labour. Various self-styled left commentators, as well as the editorial line of the Guardian, Observer and various Labour blogs is to claim that Labour is attempting to facilitate a hard Brexit and is pro-May’s deal.. These falsifications are entirely conscious as they are despite Labour repeatedly voting for a customs union, the ‘Common Market 2.0’ and for a referendum on the terms of any Brexit in parliament. Labour has now also voted a number of times against ending Freedom of Movement, because it prioritises defending living standards over bogus and reactionary immigration policies. 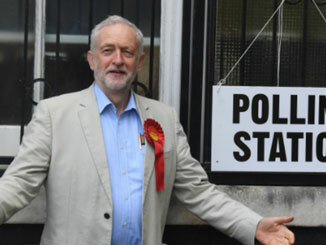 or fetishism of issues of process such as a referendum as fought for by the People’s Vote campaign – which does not focus on defending living standards and is therefore in line with the approach of right-wing Socialist Parties in Europe which have suffered electoral disasters. Such an approach might also lose a referendum on EU membership – as in 2016. Labour has rejected May’s deal and No Deal precisely because they are so damaging to living standards. While, in line with its Conference policy, it is prepared to consider a referendum as a way to stop May’s deal or a No Deal Brexit, or to remain within the EU if that is the best available practical option, this is subordinate to, and placed within the framework of, defending living standards. Labour’s own policy therefore aims to defend jobs, living standards and workers’ and environmental protections. This defends the interests of the majority and because of this it is also the basis for further advances. It is because of this correct approach that Labour is now achieving its clear poll leads over the Tories – leads which would probably by increased in a general election campaign.